When you want to edit a course or create new materials, it is important to understand how the course structure in Studio relates to the course structure that students see. This article will give you a basic overview of how the structures relate and how to create new content. * Section: This is a non-content title for a module. 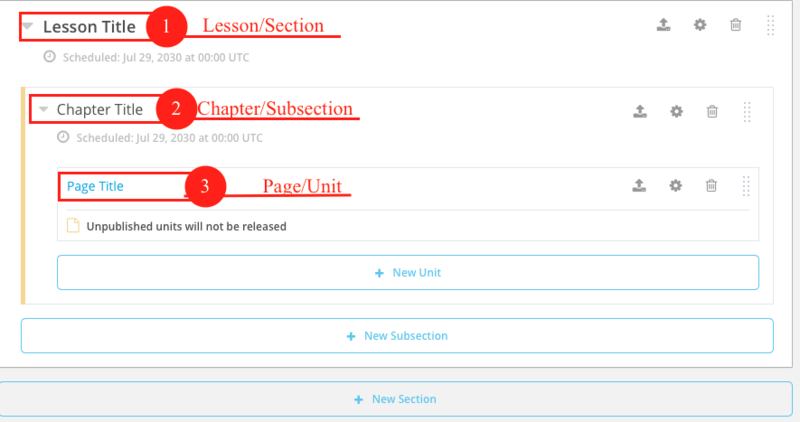 * Subsection: This is again lower-level non-content title of tutorials, videos, or quizzes. * Unit: This is equivalent to a content page or slide and can include text, multimedia, and questions. * Component: These are the individual items on each page - you can have a text component and a question component in the same unit (page). You can review the images below to understand where each item is and which level it relates to in both Studio and the student-facing page.